The Buzio stainless steel vacuum insulated water bottle might be the most impressive water bottle on his list for a number of reasons. 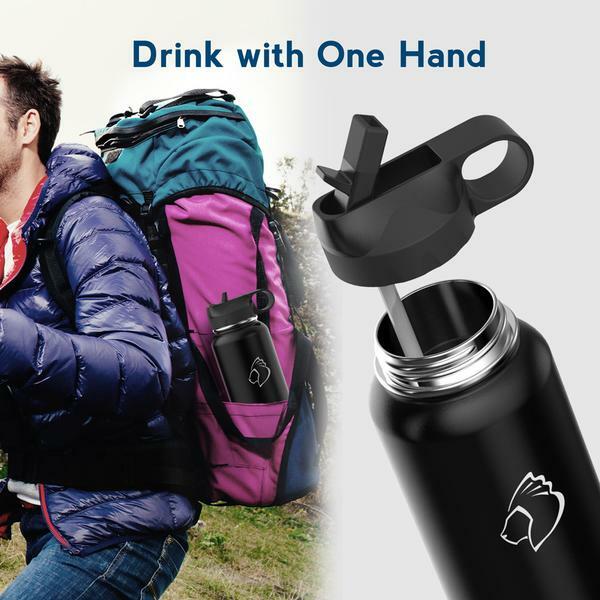 Not only does it keep cold drinks cold for 48 hours, but it also keeps hot drinks warm for 24 hours. This is double the length of time of any other water bottle that we reviewed. 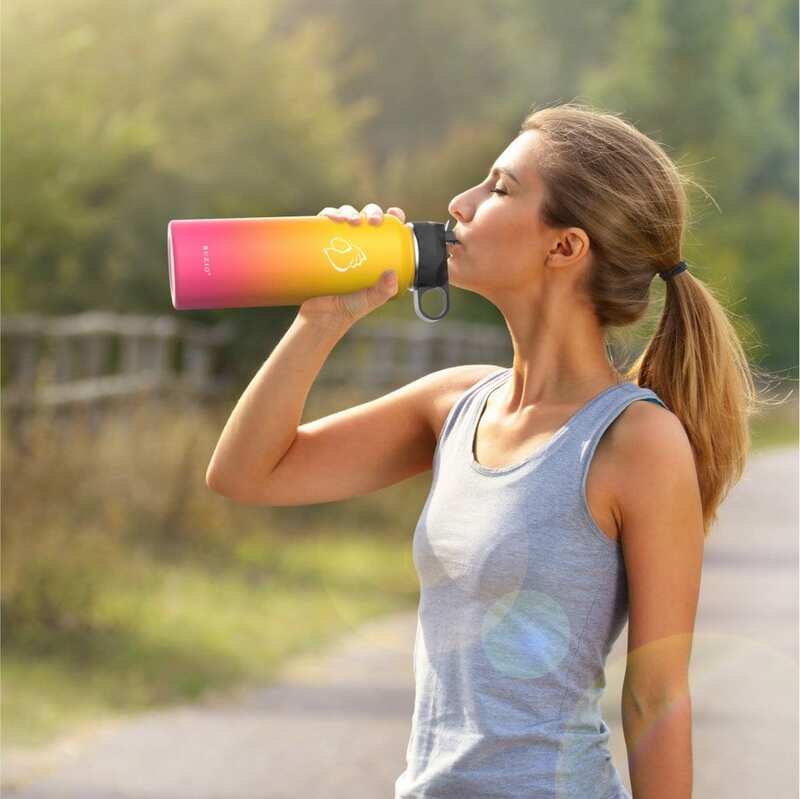 Available at both 40 ounces and 64 ounces, this water bottle will last you for the entire day. Read our full Buzio Stainless Steel Water Bottle review to see if this is the water bottle you’ve been looking for. Buzio’s goal is to combine innovation with the modern lifestyle. This company wants to provide high-performance products with great customer service. Our Buzio Stainless Steel Water Bottle review will go over the most important things you need to know if you’re considering getting this bottle. Almost all of the water bottles that we reviewed were comprised of one solid color. The Buzio product line also has solid color options. In addition, some of their bottles have a beautiful gradient. We like that they have a mix of standard colors and also more exciting ones. Many of the water bottles that we were viewed from Amazon were anywhere between 12 oz to 25 oz. 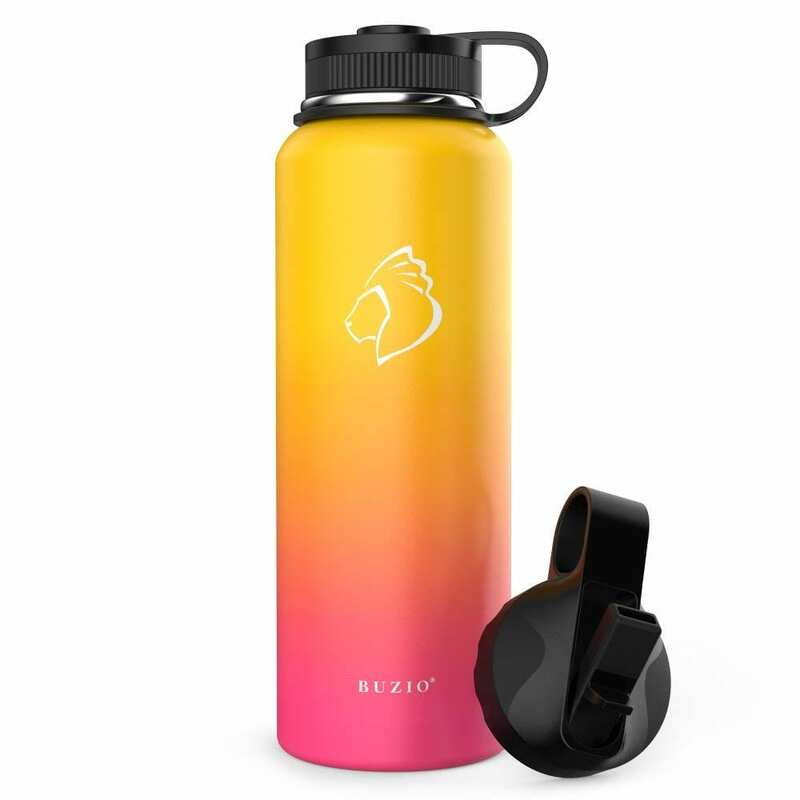 The Buzio water bottle is available in both 40 oz and 64 oz on Amazon. This is anywhere between 5 to 8 glasses of water. Even with these large sizes, the bottle is leakproof so you don’t have to worry about massive amounts of water spilling everywhere. The ability to keep a cold drink cold for 48 hours and a hot drink warm for 24 hours is an amazing achievement. The TempArmour technology helps with this incredible insulation power. Great accessories: This bottle comes with accessories like two caps. You can choose whether you’d rather use the straw lid or the flex lid. 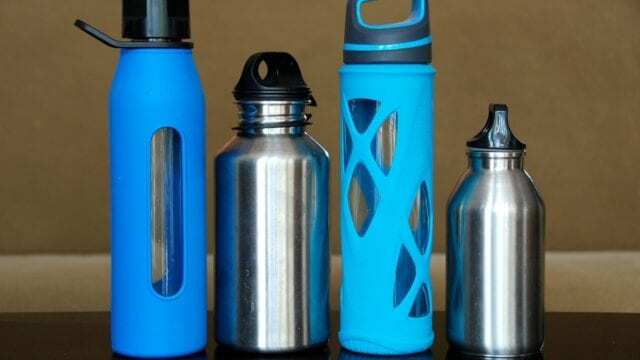 Large sizes: If you love having large water bottles to help you stay hydrated, you’ll love the large sizes that you can get with these water bottles. Long temperature control: Buzio boasts the longest temperature control, which is a great feature. 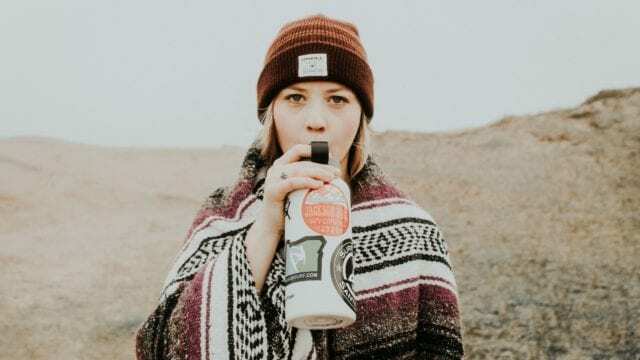 If you’re going to be away from home for a long time like on a hike or a road trip, you’ll be able to rely on the bottle keeping your beverage at the ideal temperature. 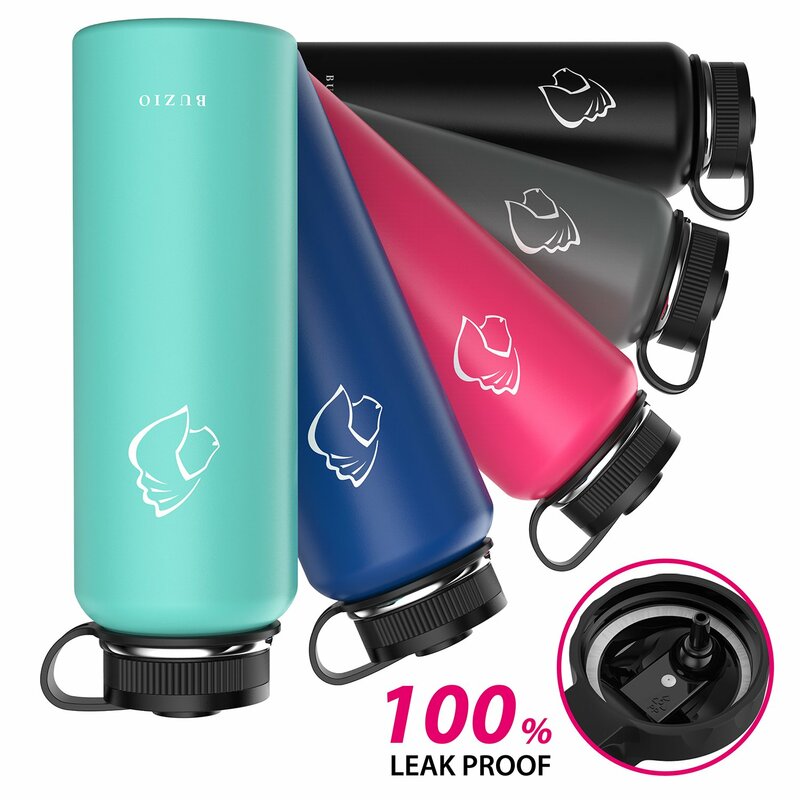 Low price point: Compared to other water bottles, particularly with the difference in how long this bottle keeps liquids insulated, this water bottle has a great price. Smaller sizes aren’t available: Some people love the larger size, but other people want a water bottle that’s a little more portable. Also, because of the large size, your water bottle won’t be able to fit in your cup holder. If you need your water bottle to fit in your cup holder, check out our other top water bottle picks. 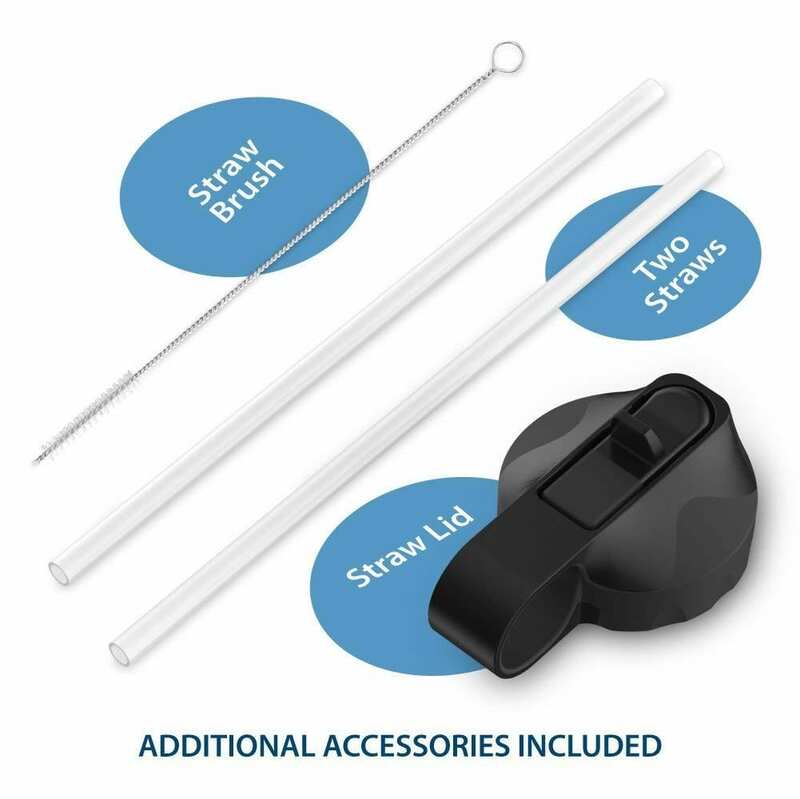 Straw alignment problems: Some Buzio Stainless Steel Water Bottle reviews say that the straw isn’t always aligned right, which makes the bottle leak or makes it hard to take a big drink with the straw. However, because this is likely a manufactured defect, you can reach out to Buzio for help if you experience this issue. This water bottle comes with great features. We’ll highlight the top features in this section of our Buzio Stainless Steel Water Bottle review. 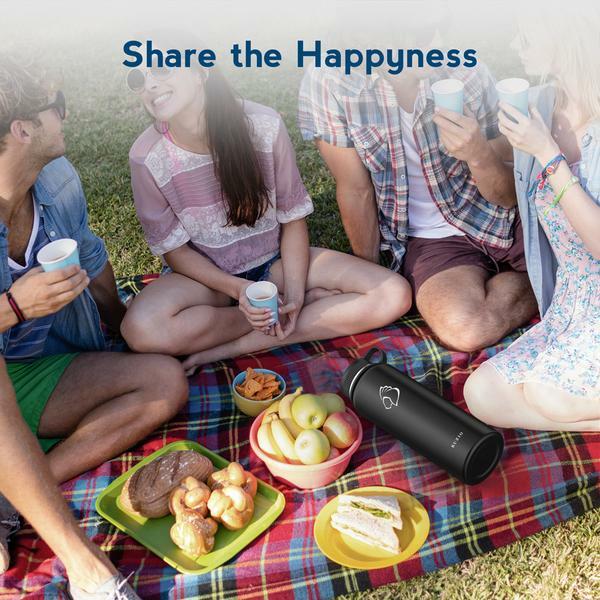 This bottle is vacuum insulated and uses a technology called TempArmour. This technology allows the bottle to maintain the temperature of your beverage for much longer than its competitors. 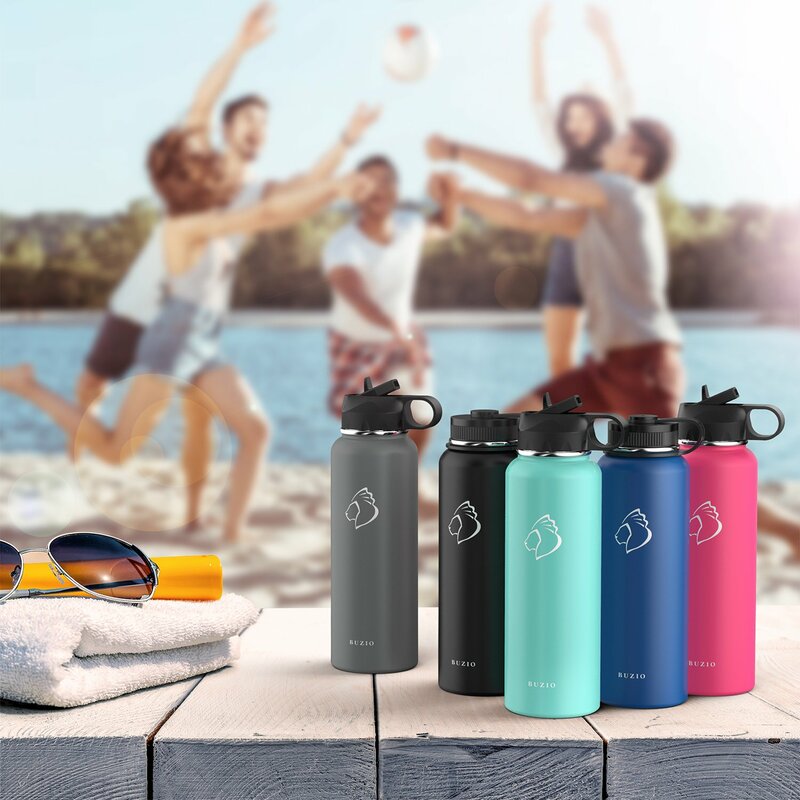 Being able to keep cold drinks cold for 48 hours and keeping drinks hot for 24 hours is impressive and the longest insulation period we’ve seen out of all our top picks for insulated water bottles. We also like that every bottle comes with two different lids. The Flex Lid is perfect for the beach, camping or hiking, and the Straw Lid is perfect for cycling and road trip. The more options a bottle gives us, the better. If you do happen to have issues with the straw, contact Buzio for help. The company has a great warranty and is proud of its customer service. This is the only bottle that we’ve included on our list that comes with a cleaning kit. The scrub brush that’s included is going to help you clean your water bottle. 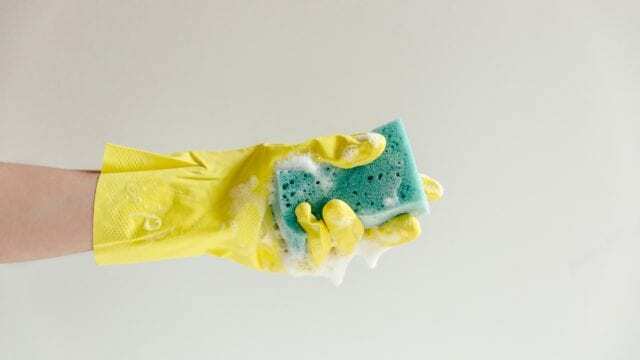 A brush is particularly helpful if you’re using your bottle for anything other than water. 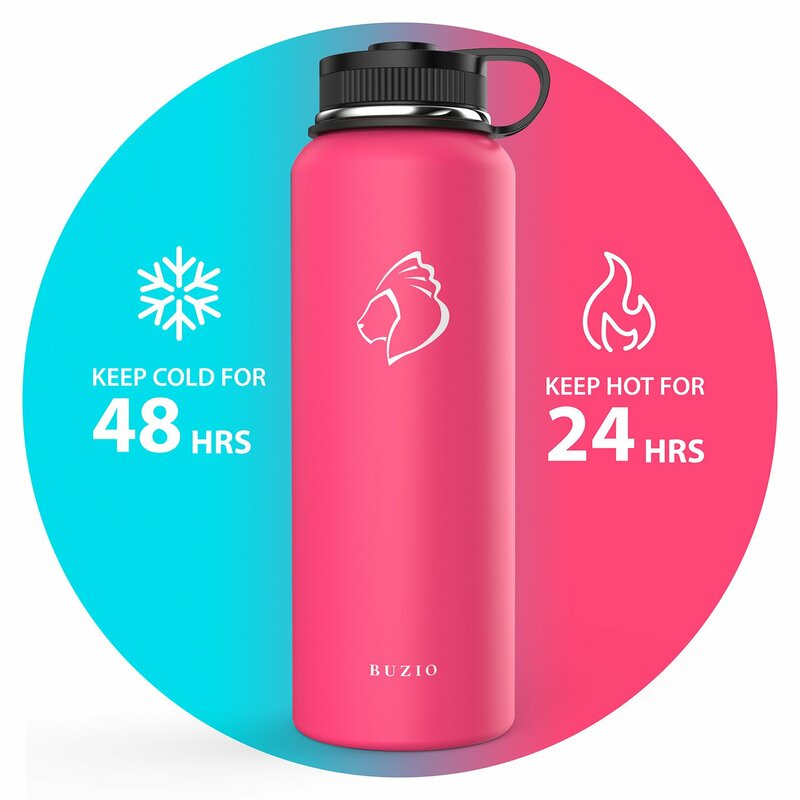 After our full Buzio Stainless Steel Water Bottle review, we think this is a great choice for anybody that is looking for great water temperature retention at a low price point with a bunch of included accessories. If you think this might be a good water bottle for your needs, learn more about it. Have you used this water bottle? If so, leave your own Buzio Stainless Steel Water Bottle review below.